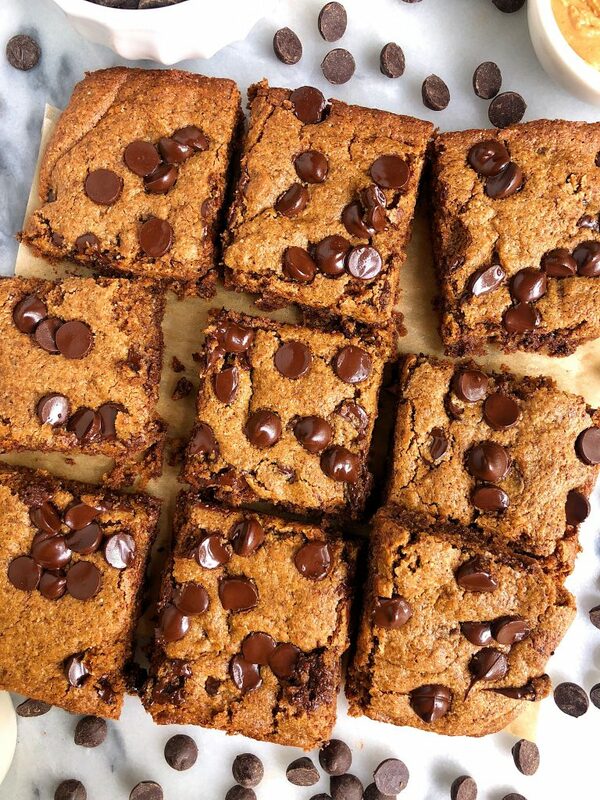 Peanut Butter Chocolate Chip Cookie Bars made with gluten-free, grain-free and vegan ingredients for a delicious dessert ready in 20 minutes! 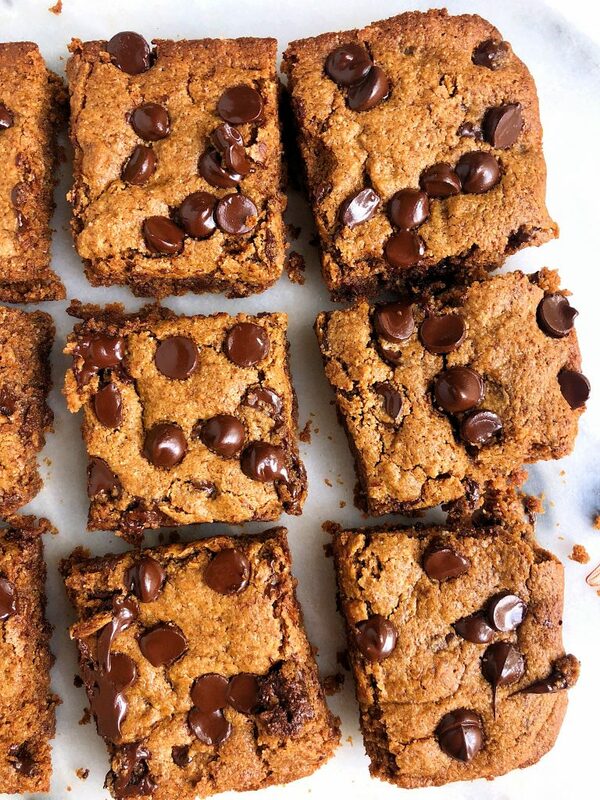 Peanut Butter Chocolate Chip Cookie Bars are HERE. How have I been blogging for almost 4 years and I’m just finally sharing a Peanut Butter Chocolate Chip Cookie Bar recipe? Anytime I’m craving something for dessert there’s a 95% chance both dark chocolate + peanut butter are involved – always. Cookies are always my go-to too and there isn’t anything more satisfying to me than warming up cookies and dipping them in some nut milk. These new cookie bars will likely be your new favorite dessert recipe. Mainly for the insane dark chocolate, peanut butter combo but also because they only require a few ingredients and they’re ready in 20 minutes! Aka you can bake these after dinner if the craving strikes then. The best accessory for any cooke recipe though is the dark chocolate involved. Today I’m using my absolute favorite, go-to allergen-friendly brand, Enjoy Life Foods. You have definitely seen their baking chocolates in your grocery store, on social media or online somewhere. They create products that are free of the top allergens like nuts, soy, dairy, wheat, etc. Always a go-to when baking for me especially with so many friends and even my brother who have a nut allergy. I pretty much snack on the bag as I’m baking like I used to when I was little with the chocolate chips my Mom had in the kitchen. They melt perfectly into any dessert and have just the right amount of sweetness. Plus you can use any of their baking chocolates. I always keep their dark chocolate morsels, semi-sweet chunks and semi-sweet mini chips in stock in the pantry. When I first started paying attention to the ingredients I was eating (about 5 years ago), I discovered their baking chocolates in my local Whole Food’s baking aisle and have been hooked ever since. I then got my Mom hooked on them for baking since their a much healthier option and my brother can even eat them! 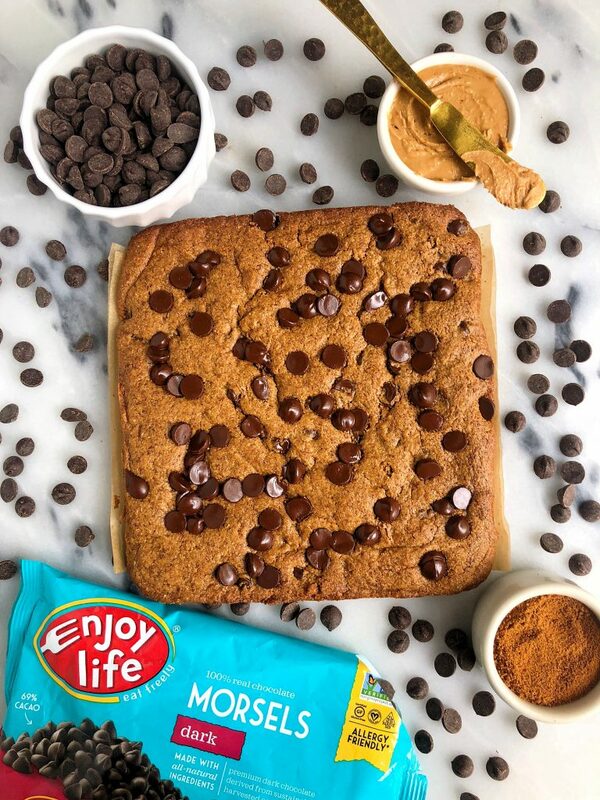 If you head over to their site, you can get a $2 off coupon for any Enjoy Life Food’s baking chocolate. Just print it out and use it in-store. If you’ve already tried their chocolates, I’d love to hear what you guys think on their site (you can review their products here!). I hope you love these Peanut Butter Chocolate Chip Cookie Bars as much as I do. They are perfect for holiday baking or just snacking if you are craving something sweet. Don’t forget to share with me on Instagram! Cannot wait to hear what you think. Add in almond flour and baking powder and mix again until no clumps! Thank you Enjoy Life Foods for sponsoring this post! It means so much to me to partner with brands I truly love and believe in! made these and they are delicious. I added a scoop of Vega mocha protein powder and a drop of almond milk, and baked about 16 mins. So yummy. thanks. easy and awesome. Hi!! I have a peanut allergy but these look incredible. Think they’d be the same if I did it with almond butter instead? absolutely!! cashew would be really good too! !